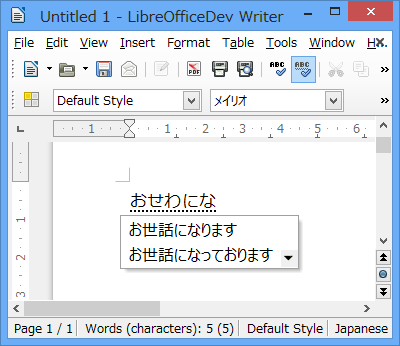 Microsoft IME 2012 is showing its suggestion window for LibreOffice Writer. Now the suggestion window is aligned to the composition text like Microsoft Word. current 2013-05-15T14:33:05 400 × 346 (19 KB) Yukawa (talk | contribs) Resized to 400 px. 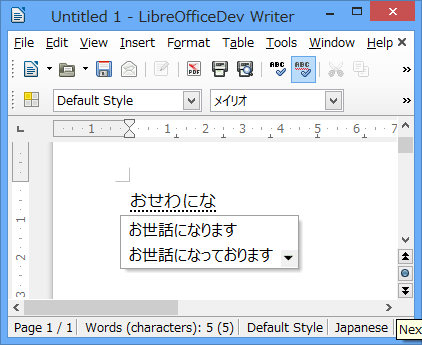 2013-05-15T14:26:02 422 × 345 (20 KB) Yukawa (talk | contribs) Microsoft IME 2012 is showing its suggestion window for LibreOffice Writer. Now the suggestion window is aligned to the composition text like Microsoft Word. This page was last edited 14:33:05, 2013-05-15 by Yohei Yukawa.